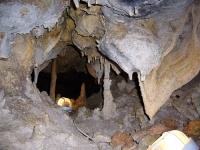 The alabaster caves at Xaghra feature amazing stalactites and stalagmites. One of them, named Calypso Cave, has an important place in Greek mythology and overlooks the red sand of Gozo's best beach, Ramla Ihamra. The grotto is believed to be the one referred to in Homer's Odyssey as being where the beautiful nymph, Calypso, kept Odysseus for seven years. Visitors have fantastic views over the bay while below remains a fortification built by the Knights of St John. Two other caves worth visiting at Xaghra are Xerri's Grotto and Ninu's Grotto, both geologically magnificent. Discovered by local families whilst digging wells on their properties, visiting the caves requires knocking on their doors and descending through their houses. The families are very friendly and happily show visitors around. Children enjoy exploring the caves and are recommended attractions for those travelling in Malta with kids or to anybody interested in the geology of the region.